With the NHL Entry Draft and free agency right around the corner, the Nashville Predators took an early step Saturday toward reshaping their team as they bid farewell to their captain and a veteran defenseman, getting younger in the process. In separate deals, the Predators sent center Jason Arnott to the New Jersey Devils and Dan Hamhuis to the Philadelphia Flyers. The Arnott trade netted them young forward Matt Halischuk and a second-round pick in the 2011 draft, while former Preds draft pick Ryan Parent came back in exchange for Hamhuis. Nashville GM David Poile said he sat down after the season to discuss the future with Arnott, who had to waive a no-trade clause for the deal back to New Jersey to be completed. "We talked about where his career was going and our team and who was going to be given chances and opportunities," Poile said. "The more we talked, the closer we came to an understanding that maybe this was in the best interests of both of us and it was time for Jason to go in a different direction. "Arnie was a good player for us and our captain, but on the other side of the coin, it is an opportunity for other players. Colin Wilson, in all likelihood, will move from left wing back to center, and I think in a lot of ways he's a young Jason Arnott: big, strong, offensive type of player." Poile was also very high on Halischuk, who played 20 games for the Devils last season when injuries ravaged their lineup early on. "He's a really good forward. 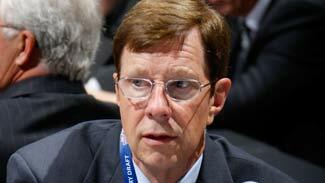 I like to call him a Predators type of player," Poile said. "He works hard at both ends of the ice, gives 100 percent all the time. He can score some goals. He's a kid who played on the same line as Nick Spaling, who our fans got to see a little bit last year. "I envision, whether it's this year or very near in the future, Spaling, Blake Geoffrion and Halischuk, they could be a line for us. They're just really honest, hard-working players, not fun to play against, guys who can kill penalties, block shots, those types of things." While trading Hamhuis, who brought experience and durability, was a tough decision, the six-year veteran was scheduled to become an unrestricted free agent on July 1 and Nashville could have lost his services and received nothing in return. "Dan Hamhuis was one of the best players to ever play here and he's done a really good job for us on and off the ice," Poile said. "We're certainly going to miss Dan, but it got to the point in our negotiations, or lack of negotiations, that (re-signing him) just wasn't going to happen. We couldn't meet his needs and he really wanted to see what he could do free agency-wise. "I think we made a very good deal under the circumstances to get back our former first-round pick Ryan Parent. Ryan is all of 23 years of age right now and I think it's the perfect timing for him to come into our team. Obviously we drafted him, we really like him. He's big, he's 6-2, 6-3, I think he's one of the best skating defensemen in the National Hockey League. He's very much a defensive defenseman and can play on the penalty-kill." Poile added he didn't think the trades necessarily changed the Predators' outlook heading into the draft, which takes place Friday and Saturday in Los Angeles. "You're going to get the same old line that we're going to take the best player possible," he said. "As we go into the draft at No. 18, our hope, in all honesty, is that we take a forward because we're deeper at defense than we are at forward. Having said that, if there's a defenseman that's available that we have rated ahead of a forward, we'll go in that direction. "I think at the end of the day it's about accumulating assets and as we see today with Dan Hamhuis, we're deep on defense and Hamhuis moves on but we're OK because we have enough depth at that position."